An updated model of the original Falcon 50, the Dassault Falcon 50EX has higher-powered engines along with a greater range. Servicing up to nine passengers, the Falcon 50EX is equipped with seven face-level windows on each side of the cabin, allowing for natural light and a relaxing, panoramic view. 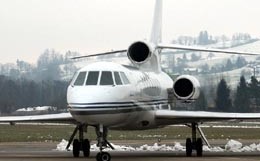 Seventeen years after the Falcon 50 was released, the Dassault Aviation Corporation decided to redesign and improve the model, keeping the best features that made the aircraft such a success while incorporating advances in technology. With its first flight in 1996, the Falcon 50EX is easily capable of flying higher, faster, and further than its predecessor while being more fuel efficient. The Falcon 50EX features both the equipment and space for hot and cold food preparation. 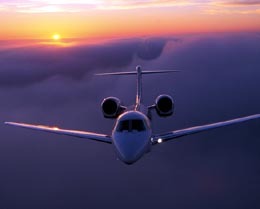 Production on the Falcon 50EX started in 1996 and ended in 2007. 100 aircraft have been built so far. 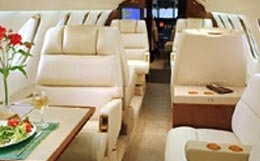 While this private jet can be arranged to seat nineteen, the Falcon 50EX is usually configured to accommodate nine passengers and is generally laid out in one four-seat club arrangement with a separate section of two facing seats and a three-seat divan. Convenient work tables fold out in between facing seats to contribute to a working environment during flight. The cabin of the Falcon 50EX is quite similar to that of the Falcon 50, measuring 23.5 feet in length, 6.1 feet in width, and 5.9 feet in height. With 115 cubic feet of internal storage with the capability of accommodating 2,200 pounds of luggage, the Falcon 50EX is more than capable of meeting your carry-on baggage requirements. Power plugs are available for charging equipment and laptops, and the temperature control is split between the cabin and the flight deck to allow for a comfortable environment for all parties. 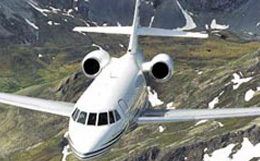 The Falcon 50EX comes standard with three Honeywell TFE731-40 turbofan engines. Each engine is rated at 3,700 pounds of thrust at sea level. An upgraded version of the TFE731-3-1C engines used on the Falcon 50, these engines are capable of performing nearly the same at high altitudes as at sea level. These engines feature Full Authority N1-reference Digital Electronic Engine Control (FADEC) systems. This system is capable of automatically starting and restarting the engines while on the ground, reducing pilot workload while optimizing performance and fuel burn. The Falcon 50EX needs only 4,935 feet to take off at sea level. This takeoff requirement increases to 7,247 feet of runway at an elevation of 5,000 feet and a temperature of 77°F. 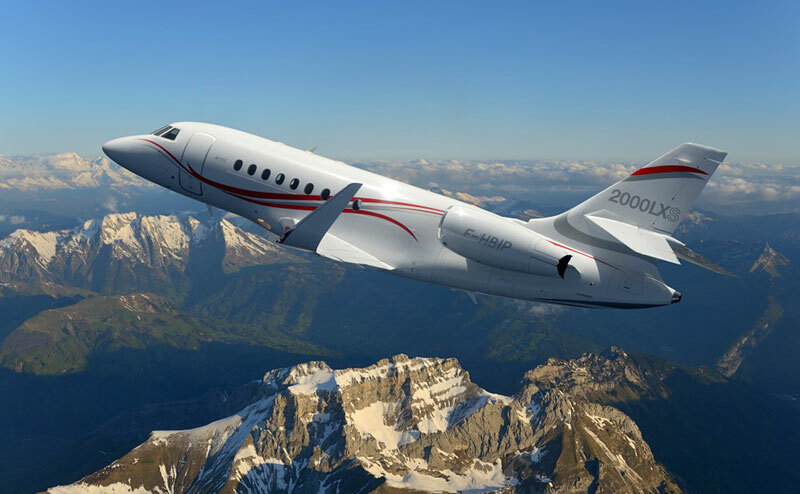 The climb performance of the Falcon 50EX is impressive, with the private business jet capable of reaching 37,000 feet in just seventeen minutes. In a long range cruise configuration, the Falcon 50EX is capable of flying at a speed of 417 knots at an altitude of 43,000 feet. For a faster flight, this private business jet is capable of maintaining 481 knots at an altitude of 39,000 feet. The Dassault Aviation Corporation selected the Collins Pro Line 4 suite as the base of the avionics system for the Falcon 50EX. Four 7.25-inch by 7.25-inch liquid crystal display screens provide flight information, functioning as primary flight displays and a multi-function display. With human factors principles incorporated into the flight deck design, flight controls are located close to the corresponding instrumentation. Some of the avionics components incorporated into the suite include a dual Pro Line II comm and nav radio system, an AlliedSignal dual Global GNS-XMS Flight Management System, dual digital air computers, a TWR-850 Doppler turbulence detection radar, and other auxiliary flight control and environment awareness systems. For more information about chartering, leasing or buying a Falcon 50EX please contact us by calling +44-20-3874-8091 or send us an email here.